When we were in Spain last summer, the Señor and I included the UNESCO World Heritage City of Salamanca on our list of places to explore. The walkable city of Salamanca, about three hours northwest of Madrid, and about four hours southeast from A Coruña, is one of the most important university cities in Spain, and in Europe. The University of Salamanca, founded in 1134, is the oldest in Spain and the 4th oldest in Europe. Today, it's known for its programs in the humanities, and in particular, languages, economics, and law. Part of the fun of visiting Salamanca is searching for, and finding the legendary frog. According to the legend, students would not graduate unless they found the frog on the main facade of the university. The frog is located on a skull, but where it is, you must find for yourself. One theory alleges that the skull represents the son of Prince Juan, the son of the Catholic Kings, who died before age 20, and the frog, or parrita, represents the doctor who tried to save him. Students who found the frog were said to have good luck with their exams and graduate as expected. 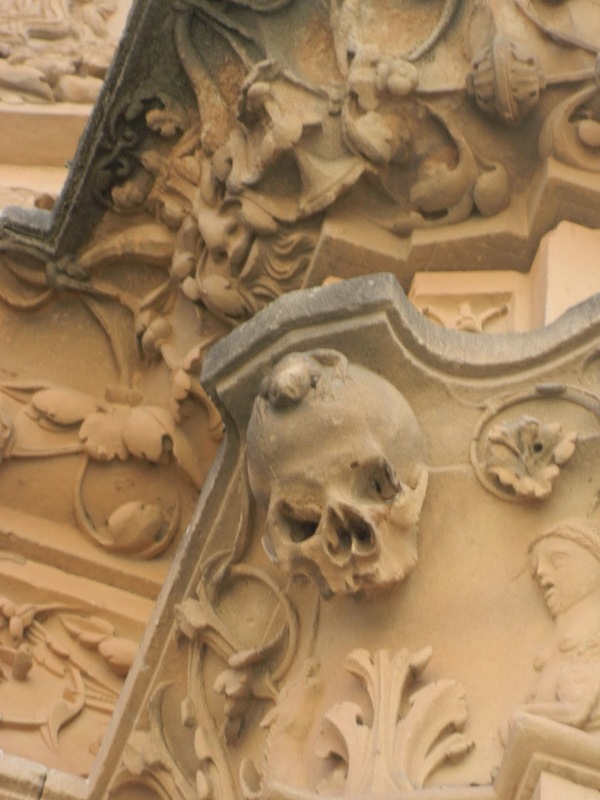 Other interesting Salamanca carvings include an astronaut and a gargoyle eating ice cream, located on the facade of the "new" Cathedral of the 16th-18th century. When the Cathedral was being restored in 1992, the workers decided to modernize it with their own "signature," using the astronaut to represent the 20th century and the gargoyle to represent the students who pass through the University's halls. Local tour guides enjoy pointing the carvings out to visitors who crane their necks to find and photograph their discoveries. Another popular Salamanca landmark is the Casa de las Conchas, or the House of Shells, with its facade of more than 300 carved scallop shells, symbol of the the Order of Santiago and the pilgrims who make their way along the Camino de Santiago across Spain. It is now home to a public library. The courtyard of the Casa de las Conchas. Located in the Plaza del Consilio de Trento (Council of Trent), this Dominican monastery was begun in 1524 and consecrated in 1610. During the Counter-Reformation, this was an important center for the Order, who founded the School of Salamanca, headed by Francisco de Vitoria, and assisted by St. Teresa of Avila and St. Ignatius of Loyola. It is also rumored that Christopher Columbus spent time here defending his idea of sailing west to the New World, against the advice of the geographers of Salamanca. Salamanca's Baroque-style Plaza Mayor, is, undoubtedly, the heart of the city, and is considered to be one of the most beautiful plazas in all of Spain. After having seen many throughout Spain, we agree. Lined by restaurants, tapas bars, ice cream parlors and boutiques, the Plaza is known as La Dorada, or The Golden City, because of its sandstone buildings. It's the perfect place for silly photo opps, having a glass of tinto de verano, or enjoying a gelato. Each weeknight, Plaza visitors are serenaded by the Tuna Singers, black-robed university students who sing for tips in the square. The crowd-pleasers sing traditional songs, accompanied by old-style instruments. On weekends, they are hired for weddings and events. Plaza Mayor is the place to be before dinner and a night out. It is filled with tourists, but it is a Salamanca must. Try Mesón Cervantes, one of Salamanca's best and oldest tapas bars. We stayed at the Tryp Salamanca, located in the city center. In the main lobby of the hotel, we were pleased to find a bulletin board offering guests opportunities to share what they loved about Salamanca...what to discover, to eat, and to buy. For newcomers like us, it was a welcomed resource. We had a great time in Salamanca. There is much to see, do, and experience. Because of its compact historical district, it's walkable and easy to see most of the city's most historical sites in a few days' time. We look forward to going back. Have you ever been to Salamanca? If so, what was your favorite place? Wow, this architecture is all so beautiful! It really was, Christine. We had such a good time; so much to see and do. It was almost magical at night...very romantic. A definite must if you ever get to Spain. I hope I can visit Salamanca on a future visit to Spain. I didn't have the opportunity to go during my last visit. There were ads about the city all over Madrid and Barcelona. Salamanca is a must see if you ever get back to Spain. It's a youthful, fun, magical, romantic city. The Plaza, alone, is worth the trip. I have been to A Coruña and many other places in Spain; but never to Salamanca. After seeing your photos and reading the descriptions, it is going on my bucket list. Great job on the blog!! ontinua escribiendo y colgando fotos!! The modern carvings are really fun. I hope you can get to Salamanca one day. It's a magical, romantic city. I found the frog story fun too. And it was fun looking for it, as well as the modern carvings. Thanks for stopping by, Jessi. Hi Kelly, what an amazing post, love, love,love Spain. 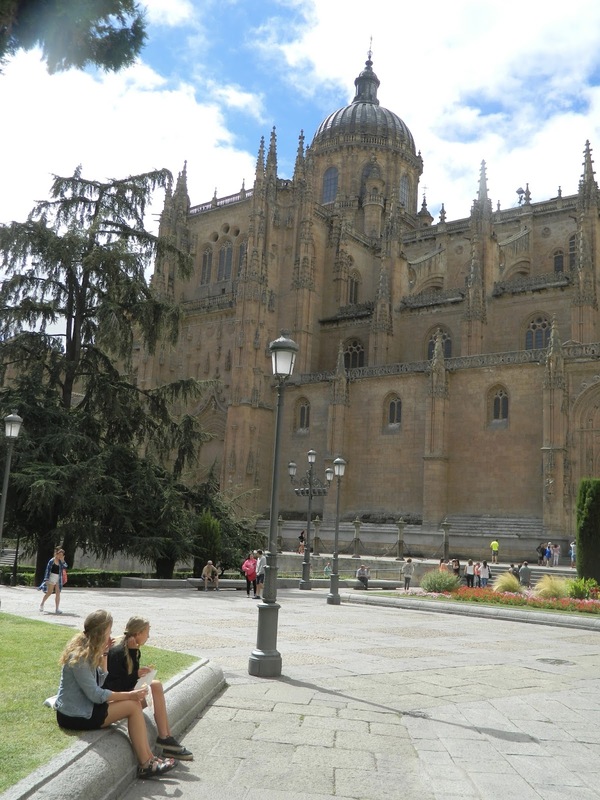 My sister-in-law did a year in Salamanca in college. I've not been to Salamanca, but Madrid, Sevilla, Toledo, Granada. The churches are so astounding, really beyond the imagination, when one things of creating something so grand, then actually bringing such grandeur to conclusion. One of my favorite posts, thanks so much for sharing, a beautiful place to tuck away for future vision! You have seen some wonderful cities in Spain, Peggy. The cathedrals are amazing, aren't they? 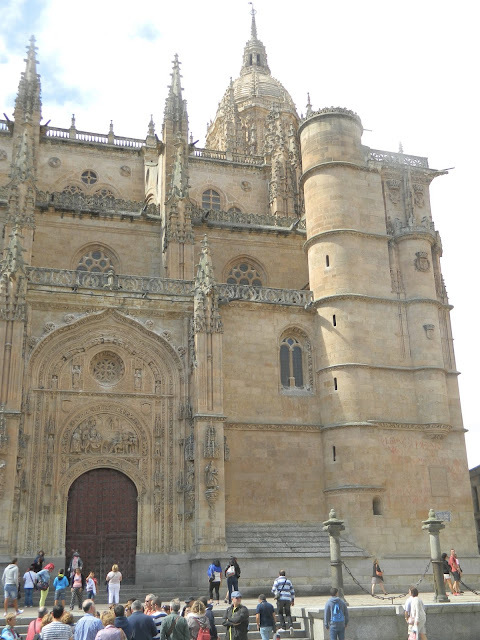 I hope you can visit Salamanca one day. It's worth the trip.